Baptism, one of two sacraments of the United Methodist Church, marks the beginning of the journey of discipleship. It is fundamentally a gift of God's grace (unearned love and mercy). It is a sign of our acceptance by God and our entrance into the Body of Christ, the church. • The logistics of the worship service. After attending Understanding Baptism, please contact Leslie Kring, at lkring@fumcr.com or 972.996.0142, to schedule a baptism in one of our services. Those who are not yet members of FUMCR should plan to join the church the same Sunday as the baptism. Sprinkling of water from the baptismal font is the most common form. Pouring and immersion are also practiced. Baptism is available to persons of all ages. Infant baptism is the predominate form in our church because it is the perfect expression of the reception of God's amazing grace, offered to us out of God's loving Spirit, not in response to our faith or worthiness. 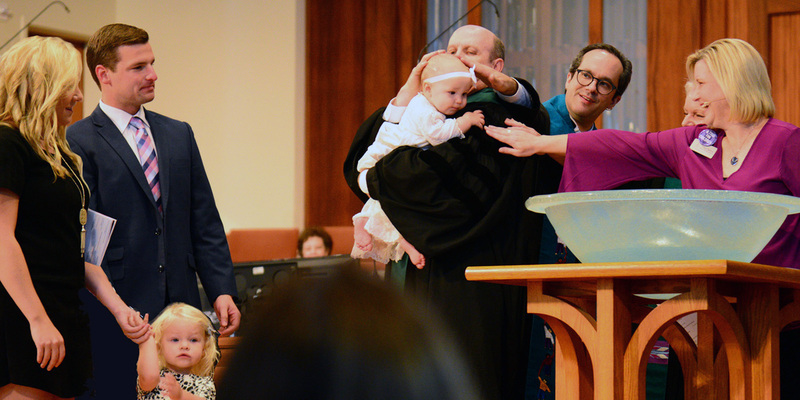 As a sacrament, infant baptism is about what God is doing in the life of the child. The parents make a commitment to raise the child in the church. Baptism, as a sacrament, is distinct from "dedication" or "christening." At any age, baptism is God's gift of grace to us and is distinct from our profession of faith. "Baptism is at the heart of the gospel of grace, and it is at the core of the church's mission. When we baptize we say what we understand as Christians about ourselves and our community: that we are loved into being by God, and lost because of sin, but redeemed and saved in Jesus Christ to live new lives and look for his coming again in glory. As baptized people of God, we therefore respond with praise and thanksgiving, praying that God's will be done in our own lives." (By Water and the Spirit Study Guide, p. 49) We are baptized into the church universal, rather than into an individual local church; therefore baptism always precedes church membership. Where holy communion is a sacrament that is repeated over and over, baptism is done only once in someone's life. This is based on the belief that baptism is a covenant between the person baptized and God, and God never breaks God's side of the covenant. If we fall away from faith and break our side of the covenant, we can participate in a remembrance of our baptism and a re-commitment to our faith. We recognize and honor the baptism of anyone baptized in a Christian denomination.